Following her launch last month, Hemisphere has recently been delivered by Pendennis and is currently cruising the Côte d'Azur. 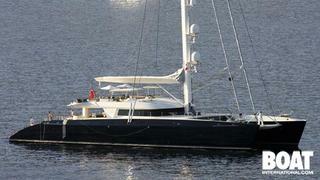 At 44.2m, she is the world's largest luxury sailing catamaran. Hemisphere was designed by leading multihull naval architects Van Peteghem Lauriot Prévost (VPLP), and has a Michael Leach interior. She boasts a spacious flybridge with jacuzzi, sunpads and shaded dining along with a vast indoor/outdoor living area on the main deck. Her relaxed, elegant interior is the epitome of contemporary chic and the yacht’s exceptional volume offers a high degree of luxury without a trace of glitz. Burgess has been appointed to manage the yacht’s charter programme which will commence this winter in the Caribbean with rates starting at €175,000 per week. Following this, she will transit the Panama Canal into the South Pacific for summer 2012. Hemisphere will be on display at the Monaco Yacht Show next month, and we will also be featuring her in Boat International magazine in the near future.